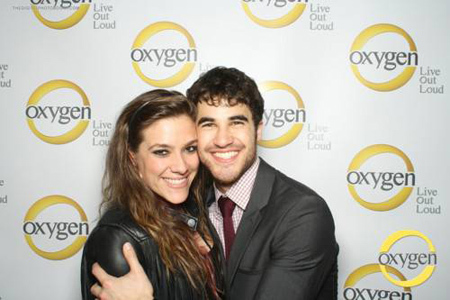 Darren Criss and his Girlfriend Mia Swier are dating each other: Is The Lovely pair Married? The young and charming heartthrob Darren Criss is a "Glee" superstar. Teenage girls are still crushing and blushing over him even though the series is over. He has been in the relationship with Mia Swier for years now. Both are enjoying being in the relationship with each other but in their sparkling Loveland, there have been many controversies relating fans not liking Mia as Darren's girlfriend. Let's see how those turmoils came and how they affected both individually. Let's know all the gossips together. Darren Criss' and Mia Swier's dating life: Is The Couple Married? Both are equally talented and gorgeous and there is no doubt that they are one of the cutest couples in town. Darren Criss was always private about his personal life in the media for many years. But recently in an interview, the interviewer sated Mia as her girlfriend and shockingly he didn’t correct him or defended himself. That was a clever move indeed to tell everyone indirectly about the relationship. After seven and a half years of dating, the couple announced their engagement in January 2018. The lovely pair took almost one year to tie the knot! Criss and Mia married on 16th February 2019 at a hotel in New Orleans with many Glee co-stars attending the event. "Mia and I have had seven and a half years of fun, wacky, wonderful, CRAZY adventures together. And I'm happy to announce that we're kicking those adventures up a notch. We're going for it. To boldly go where neither of us have gone before. Engage." Let's congratulate the happy couple for their blissful life in the following days! Are they still involved with each other? The two lovebirds are constantly seen in public being all cozy and comfortable. Reportedly they have been in an on-off relationship for years now but never really spoke about it. The exact date to mention was back in 2010. Damn! Darren’s really smooth in keeping secrets. They are quite happy now when they told us what is going on between them. We really hope they continue to date each other. The dark haired dashing American man is widely known for his strong and prominent portrayal of Blaine Anderson in the famous English musical series "Glee". He debuted in "Eastwick" in 2009 with a five-episode arc. In the same year, he also appeared in an episode of series "Cold Case". The cute and witty Darren in real life made his first-ever appearance in the series Glee in its second season’s “never been kissed” episode in 2010. The 32-year-old started in 2010 and sang as a lead in Glee club for around 5 years when in 2015 Glee shot its final season. The girlfriend on the other side, Mia is a young writer/ producer mainly in Fox Star Networks. According to IMDB, the young and dazzling lady produces and directs promotional content for series. She even contributed to projects like "Glee", "The Mindy Project", "New Girl", and "Gracepoint". Her talent ladies and gentlemen don’t end here. She is also rock and roll bassist/vocalist on the side. Darren started in Glee as Blaine Anderson who was apparently a lover for Kurt. Their sizzling chemistry led the director to put the two in a love relationship onscreen. Still many of the fans see him as Blaine and want him to be with Kurt off-screen as well. But unfortunately, that’s not the case. So the fans poured their frustration on poor Mia calling her a 'Satan'. This whole public drama annoyed Darren aka Blaine thus he criticized his fans via Twitter. If you disrespect my girl, you disrespect me. You got a problem you take it up with me & we can talk. Like ppl with integrity. Kluvyabyeee?? Seems Darren is quite protective and gentlemen towards his off-screen sweetheart. Well, we wish them all the luck in the future.